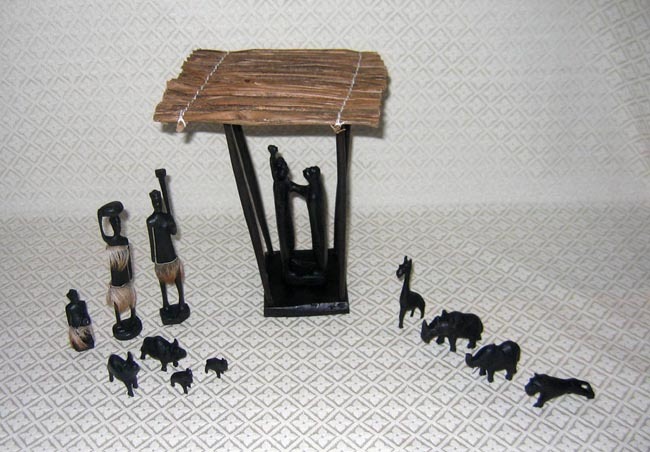 This Nativity scene was hand-carved by Vasco João Andrade near Beira, Mozambique. He was born on June 25, 1975, in Marromeu. He now lives in Vila Massane, a small area in Manga, a rural suburb of Beira, Mozambique. His parents were João Andrade and Mario Chapo—his father was the one who taught him to sculpt as a means to help support their family. He sculpts with the help of several friends. They buy their wood in Nhamatanda, a district some miles away. Vasco now lives with his wife and three children. He finished third grade under the colonial educational system (the equivalent of a sixth grade education under the current Mozambican system). He wasn’t able to study further because he was recruited as a soldier by rebel forces during the Mozambican civil war. He was only 11 years old. He says he is very happy, because with the money he earns from his work he is able to support his family. He says his work requires a lot of patience and a lot of imagination. One unique feature of this set is that baby Jesus is presented as a small boy on top of Joseph’s shoulders with both parents looking up at him. This piece is 6.5 inches tall. The set also contains a unique stable covered in fiber from banana trees. The stable is 9.5 inches tall and the roof measures 7 by 6 inches. Three villagers have come to pay their respects to Jesus: a man holding a plow, a woman with a bowl on her head, and a boy carrying a stick. The villagers’ clothing is real animal fur. The man and woman are 6 inches tall. The eight animals in the set are a giraffe, a rhino, an elephant, and a lion on the right side of the picture, with a water buffalo and gazelle with two baby gazelles on the left. The giraffe is 3 inches tall. The other animals are 2 inches tall.